Sage Journals, an independent publisher of academic research on a global scale. Presented a white paper titled, “Non-destructive testing – current capabilities and future directions.” In it, author P. Crawley pointed out that the need to increase inspection speeds to keeps costs down is paramount in today’s non-destructive testing environment. 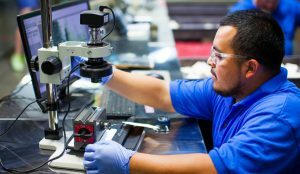 We know that non-destructive testing and parts cleaning and finishing is an essential investment that manufacturers make. And it is key that they be able to quantify the benefits and costs. Speed, sensitivity, coverage and reliability are factors that determine non-destructive testing performance. The non-destructive testing (NDT) industry is reviewed, the major techniques being described and current development directions and challenges identified. Visual inspection is probably the most widely used NDT technique. But it does not generally involve the purchase of dedicated NDT instrumentation so it does not appear in market estimates. The NDT market is dominated by the ‘big five’ techniques: radiography, ultrasonics….Click here to read the full article.